Zombie fans the world over gather in salivating droves at conventions to celebrate George A. Romero’s series of gut guzzling horror movies. Starting with the original black and white 1968 classic Night of the Living Dead, these low budget films have set the benchmark for terror with their hideous special effects by Romero’s partner in gore Tom Savini. 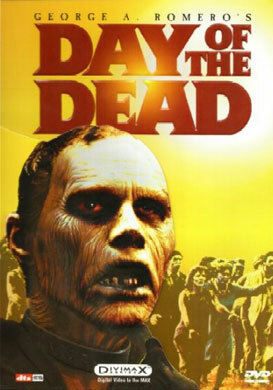 The second in the series, Dawn of the Dead (1978), became one of the very first midnight movie sensations, unhinging the jaws of audience members at special underground screenings with its gory story of four survivors trying to establish a Utopian existence while barricaded inside a shopping mall besieged by flesh-eating cadavers. Then Day of the Dead came along, taking blood and guts to another level altogether. Twelve people are holed up in an underground bunker with zombies cordoned off in the lower tunnels and rattling the gates up above. The men and sole woman (Lori Cardille) are trapped in what is essentially a 14 mile tombstone – an old army missile facility that’s also being used as a makeshift laboratory. At the forefront of the research is the blood splattered Dr Logan (Richard Liberty) who the commander claims is slicing up too many zombies with too few results. But Logan has found Bub (Sherman Howard), a special specimen with the potential to become domesticated. Grotesque he may be but Bub is the only zombie in any of Romero’s films to have a line of dialogue and may just hold the key to controlling the plague…if only they could all stay alive in order to find out! As the corpses mount in the mandatory banquet scene the movie tips way over the edge into the B-grade madness that secures its cult status. If you’ve got a weak stomach, steer clear.